Shakti means strength, power, female energy; it is the female demonstration of the divine one. The veneration of the various forms of Shakti is largely diffused in India. Toward halves the first millennium it affirms in the Asian subcontinent a new spiritual and religious tide: the shaktism. 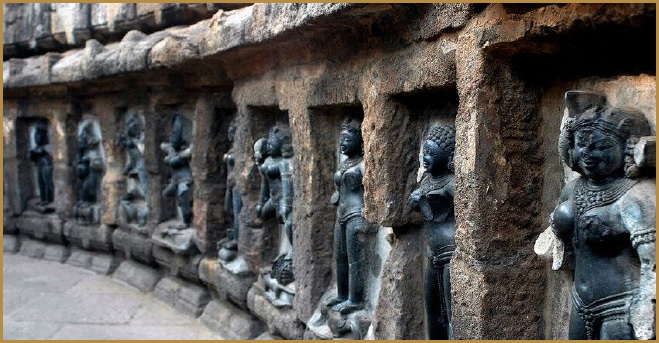 A myriad of forms of the great mother went to place side by side to the preexisting masculine hinduist divinities forming some divine couples. This tide notably also influenced the Buddhism so that to the various figures of the Buddhas were placed side by side by a female figure. Next to the masculine divinity,that represents the unchangeable one, there is the female divinity ,representing the strength, the power and therefore the divine energy. This is a real religious revolution that also corresponds to a new spiritual view. In the VII century AD the shaktism produced its sacred texts: the Tantras. The deepest roots of shaktism and tantrism can be individualized in the cult of the great mother of the prevedic people. These cults have analogies in the whole rest of the world and bring us to the origins of the spirituality. Kali or Durga, black Mothers in the most ancient cultures, black goddesses in ancient Greece or black Christians Madonnas comes from one prototype. An archaic divinity that has withstood the sexist traditions as that Vedic, and that resurfaces with new vitality with the Durga and Kali cults in all their forms. 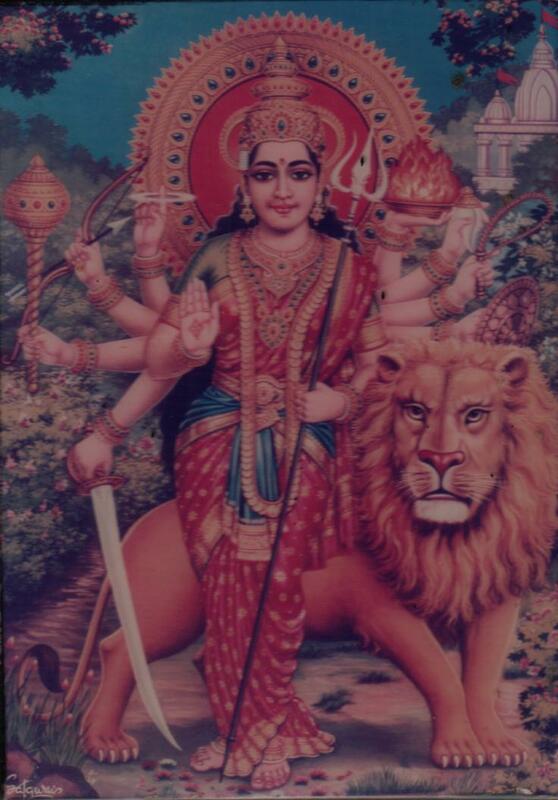 Durga, the great mother, was born from the union of all the energies of the masculine divinities worn out by the endless struggle with the Asuras (demons). In her many arms handed the emblems of all the divinities. Its strength is dreadful. The goddess defeats Mahishasura, such a powerful demon to compromised the equilibrium of the whole universe. She kills him several times but every time the demon rise even more strong assuming more and more terrible forms. Finally, thanks to the energy she got drinking a cup of sacred wine, Durga cuts off the head of Mahishasura killing the demon definately. Finally the Devas (Gods) can relax and they solemnly honored Durga that since then is also called Mahishasuramardini (She that killed Mahisha the great demon). The black goddess appears for the first time in the Devi Mahatmya or Durga Saptasati from the Marcandeya Purana. The devotion to Kali,, the goddess that more expresses the archetype of the great mother, has its fulcrum in the tantrism. Her form so terrible symbolizes the power, the strength, the good that defeats the evil, and is the demonstration of the divine power. Black because it is the color where everything disappears, also called Digambari (dressed of sky), Naked and with great breasts as the primordial goddesses. As white, yellow, and other colours all disappear in black, in the same way all beings enter Kali. Therefore it is that by those who have attained the knowledge of the means of final liberation, the attributeless, formless, and beneficent Kalashakti is endowed with the colour of blackness. As the eternal and inexhaustible One image of Kala and soul of beneficence is nectar itself, therefore the sign of the Moon is placed on her forehead. As She surveys the entire universe, which is the product of time, with Her three eyes – the Moon, the Sun, and Fire – therefore she is endowed with three eyes. As She devours all existence, as She chews all things existing with her fierce teeth, therefore a mass of blood is imagined to be the apparel of the Queen of the Devas (at the final dissolution). As time after time She protects all beings from danger, and as She directs them in the paths of duty, her hands are lifted up to dispel fear and grant blessings. 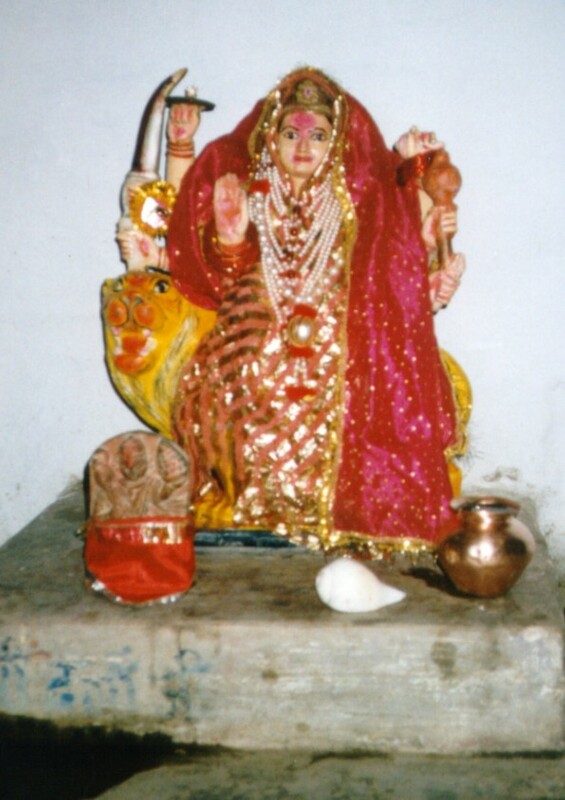 As She encompasses the universe, which is the product of Rajoguna, she is spoken of, as the Devi who is seated on the red lotus, gazing at Kala drunk with intoxicating wine and playing with the universe. The Devi also, whose substance is intelligence, witnesseth all things . 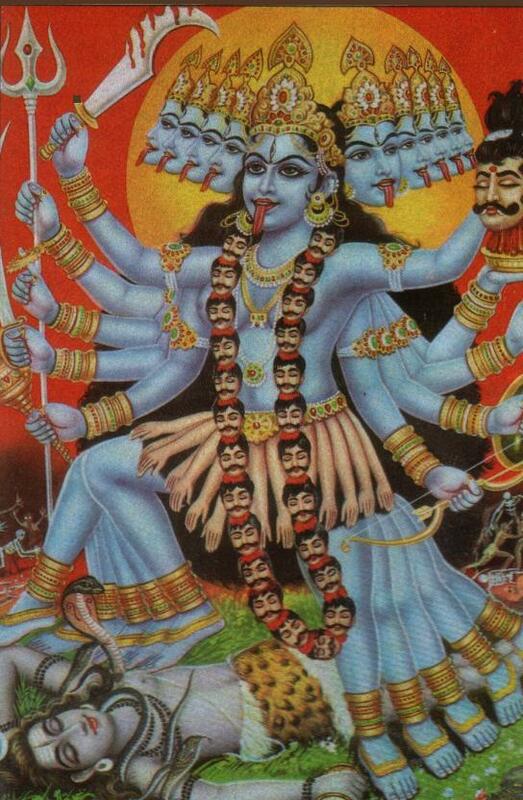 Kali: The ultimate form of Brahman, "Devourer of Time". Tara: The Goddess as Guide and Protector, or Who Saves. Who offers the ultimate knowledge which gives salvation (also known as Neel Saraswati). Shodashi or Lalita Tripurasundari: The Goddess Who is "Beautiful in the Three Worlds"; the "Tantric Parvati" or the "Moksha Mukta". Bhuvaneshvari: The Goddess as World Mother, or whose body is the cosmos. Dhumavati: The Widow Goddess, or the Goddess of death. Bagalamukhi: The Goddess who paralyzes enemies. Matangi: the Prime Minister of Lalita; the "Tantric Saraswati". Kamala: The Lotus Goddess; the "Tantric Lakshmi". The 64 yoginis are forms of Durga, the Divine Mother. They also worshiped as the body parts of Devi. Their number, the square of eight, is referred to the attendants the 8 Matrika, but also to the 64 vital airs currents in the human body. The Yoginis are identified with the Matrikas, each Matrika has 8 assistants Yoginis. Their mythological history defines them as emanations of the Devi and helped to defeat the demons Shumbha and Nishumbha. They are depicted naked and adorned with jewels. The cult of the Yoginis is particularly strong in Orissa with temples in Hirapur and Ranipur-Jharial. The other temples are in Madhya Pradesh in Khajuraho and Bhedaghat. I bow to You Oh Goddess Durga, the bestower of happiness! I bow to You Oh Goddess Amba, who ends all miseries. The radiance of your light is limitless and all pervading and all the three realms (Earth, Heaven and the Nether World) are enlightened by Thee. Your face is like the moon and mouth very huge. Your eyes shine with a red glow and You have a Frightening frown. Oh Mother, your look is enchanting, the very sight of which ensures welfare of the devout. All the powers of the World repose in Thee and it is You who provides food and wealth for the world's survival. Like the feeding Mother Annapoorna, You nurture the whole universe and You are the one who appears like the timeless Bala Sundari (young girl of extreme beauty). At the time of dissolution, it is You, Oh Mother, who destroys everything. You are the beloved consort of Lord Shiva, Gori (Parvati). Lord Shiva and all yogis always chant your praise. Brahma, Vishnu and all other Gods ever meditate on You. You appear in the form of Goddess Saraswati too, to grant wisdom to the sages and thus ensure their welfare. Oh Mother Amba! It was You who appeared in the form of Narsimha, sundering the pillar. Thus You saved Prahlad and Hiranyakashyap also went to Heaven as he was killed by your hands. In the form of Goddess Lakshmi, Oh Mother, you appear in this world and repose by the side of Shree Narayan. Dwelling in the ocean of milk, Oh Goddess, with Lord Vishnu, please fulfill my desires. Oh Bhavani, the famous Goddess of Hingalaja is no one else but You Yourself. Illimitable is your Glory, defying description. You are yourself Matangi and Dhoomavati Mata. It is You who appear as Bhuvaneshwari and Bagalamukhi Devi to bestow happiness to all. It is You who redeem the world, appearing in the form of Shree Bhairavi, Taradevi and Chhinnamasta Devi, and end its sorrows. Reposing gracefully upon your vehicle, Oh Goddess Bhavani, You are welcome by the brave Langour (Lord Hanuman). When You appear in the form of Goddess Kali, with sword in one hand and a Khappar (a bowl made of half the portion of coco-de-la-mer, the coconut of the sea) in the other, even Time flees in panic. Beholding You, well armed, with a Trident in your hand, the enemy's heart aches with the sting of fear. You also repose in the form of Devi at Nagarkot in Kangara. Thus all the three realms shudder in the might of your glory. You slayed the demons like Shumbh & Nishumb and massacred the thousand forms of the dreaded Demon Raktabeej. When the earth was severely distressed bearing the load of the sins of the arrogant Mahishasur. Thus, whenever the noble saints were distressed, it is You Oh Mother, who came to their rescue. All the realms including the Amarpuri (divine realm) remain sorrowless and happy by Your Grace. Oh Goddess! 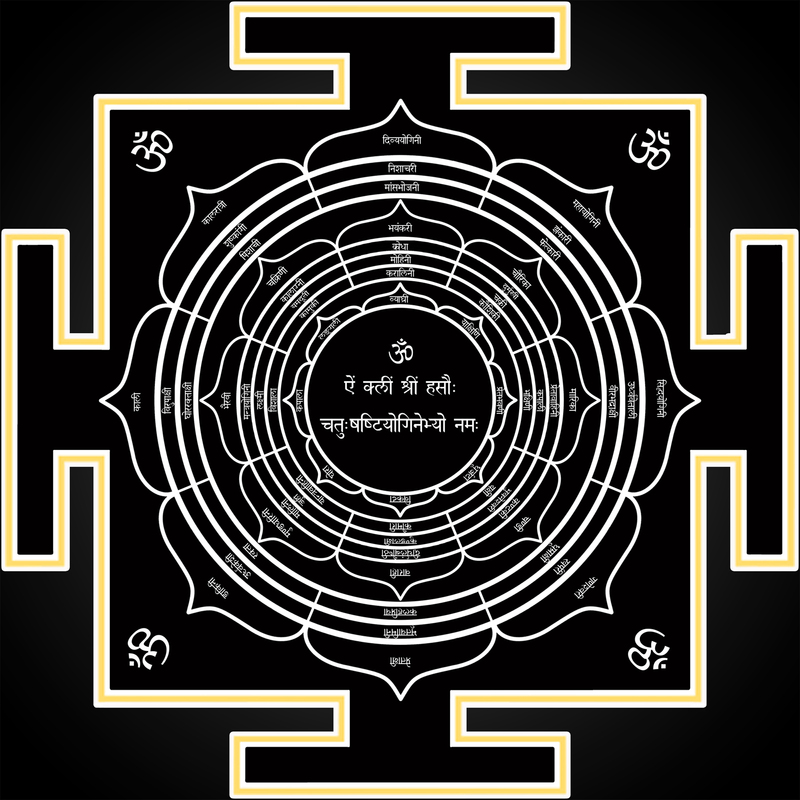 It is the symbol of Your glory that is burning brightly at Shree JwalaJi. All men and women ever worship You, Oh Mother! He who sings Your glory with devotion, love, and sincerity remains beyond the reach of grief and poverty. All the yogis, gods and sages openly declare that without your favor one can't establish communion with God. Shankaracharya had performed once a special penance called Acharaj and by virtue of which he had subdued his anger and desire. Since He did not realize your immense glory, all His powers waned and then He repented hitherto. Then He sought refuge in You, chanted Your glory: "victory, victory, victory to Thee, Oh Jagadamba Bhavani". Then, Oh Primal Goddess Jagadamba, You were propitiated and in no time You bestowed Him with his lost powers. Oh Mother! Severe afflictions distress me and no one except Your Honored Self can provide relief please end my afflictions. Hopes and longings ever torture me. All sorts of passions and lust ever torment my heart. Oh Goddess Bhavani! I meditate only upon You please kill my enemies, Oh Queen! Oh Merciful Mother! Show me your favor and make me feel happy by bestowing me with all sorts of riches and powers. Oh Mother! May I be respectable of Your grace as long as I live, ever recounting the feats of Your Glory to all. This way, whoever sings this Durga Chalisa shall ever enjoy all sorts of pleasures and shall attain the highest state in the end. Deeming Devidas to have sought Your shelter, Oh Bhavani, grant me Your favor. The beautiful skirt made of the severed arms of your enemies looks so becoming like the sacred ornaments adorning every part of your body. Your ten dread feet are all smeared with blood and your long tongue sticks out, rendering your appearance frightening. Blessed, blessed, blessed are you, O Mother Kali, who cause your enemies to lick the dust one after another. I entreat you, O mother, to fulfil your votary’s expectations and grant me your favour. Now I say that Kali Kavach, the one which Lord Brahma had uttered for invoking Mahakali for eliminating the darkness. Lord Shiva, the victor of all the three realms, Mahashiva is the narrator of this Kali Kavach. Its meter is anushtup (Vedic verse) and its deity is Mahakali, the eliminator of all the darkness. The seed mantra of maya is the seed. Beauty is the energy that lifts to gladness. Krim is the pin and the perfect attainment and protection of desires is the application for which it is widely known. Hrim, may the Foremost protect my head. Shrim, may the Goddess Devi who eliminates darkness protect my face. Krim, may the Supreme Energy repose in my heart as the source of all strength. May the Greater than the Greatest repose in my throat to protect ever my voice. O Goddess, Creator of the Perceivable Universe, please repose in my eyes to protect my vision. O Goddess of peace, Devi Shankari, may You protect my ears. May the Goddess Mahamaya, the ultimate Measurement of Consciousness, protect my nose. O welfare endower, may you protect my tongue and taste. O Goddess of all piety, Kaumari Devi, please protect my teeth. O Goddess who resides in the lotus, Kamalamayi, may You protect my cheeks. O Goddess of forgiveness, Kshamamayi, may You protect my lips, and O Charuhasini, protect my chin. O Param Mahamayi! May You protect my neck, and She who is the manifestation of all the noble sentiments of altruism, protect my upper back. May the Goddess who is the grantor of all strength protect both my arms, and O giver of non-duality, Kaivalyadayini, protect both my hands. May the extremely fierce one protect both my shoulders. May the illuminator of the three worlds protect my back. May She who is indivisible from any side ensure my protection from every side, and may She who exists in all power and capability protect my waist. May the Goddess with great eyes protect my navel region. 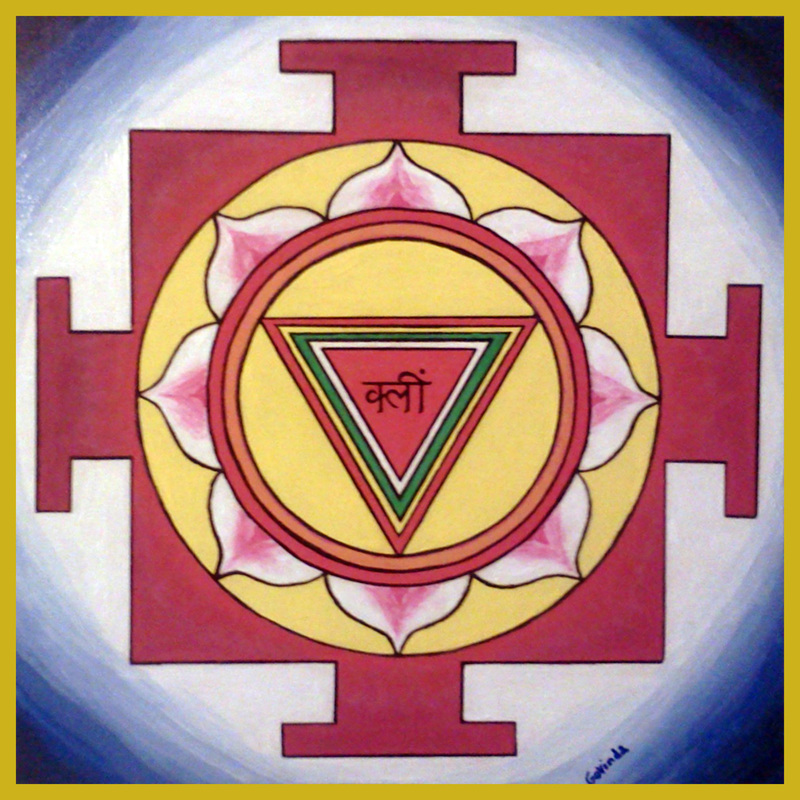 May the Goddess of light, Prabhavati, protect my private region. May the Goddess who is all welfare, Kalyani, protect my thigh region, and may Parvati Herself protect both my feet. Victory to thee, Durga Devi! Please protect my life breath and all the Siddhis that I possess. May She who grants all achievement protect my whole body. May She also protect all those my parts that have not been mentioned in this prayer or that are not mentionable. May I always stay under the protection of that Devi who is the foremost eternal Divine Mother, She who removes all the darkness. This whole universe is the exposition of Her manifestation, She Who is the victor of all the three realms. This is the Kavach of that Devi Kali who removes all darkness and who is the Eternal Divine Mother. The aspirant who recites this Kavach with full feeling every morning after respectfully invoking the Goddess has all desires fulfilled. With total surrender unto the Goddess he gets the most complete attainment of perfection, and with limited offerings or surrender he receives limited rewards. Those who recite this Kavach have their desires fulfilled; the issueless get children, the moneyless get riches, and the students get good education. Thus they who read this Kavach get their ambitions realized. Reciting this Kavach a thousand times is equivalent to completing the homa offering. This Kavach if written on the bark of the birch tree with a sandalwood piece, wood-apple scent, red vermilion, and red sandalwood powder mixed to a paste, would give much reward to the person who wears it. When worn on the crown of the head, at the upper right arm, at the throat, or on the waist, Kalika Devi yields to such a person and bestows the desired results. The reading of this Kavach removes all the fears of the aspirant and grants him victory everywhere. Such a person remains free from infirmities and is long-aged; even those who are weak become strong. Such a native becomes an erudite scholar well versed in all scriptural disciplines. He develops a sharp and powerful brain. He receives protection in the entire world, becomes established in enjoyment, and surely receives salvation (Moksha). This way he passes his entire life in prosperity and happiness. Now you are capable of knowing this supreme knowledge, which destroys all the filth of this Age of Darkness and removes all the darkness of ignorance. 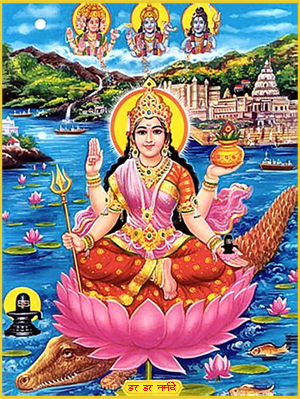 Salutations to Devi Narmada. Your river-body illumined with sacred drops of water, flows with mischievous playfulness, bending with waves. Your Sacred Water has the divine power to transform those who are prone to hatred, the hatred born of sins. You put an end to the fear of the messenger of Death by giving Your protective Armor. You confer Your Divine Touch to the Lowly Fish merged in Your Holy Waters. You take away the weight of the sins in this age of Kali; and You are the foremost among all Tirthas (Pilgrimage). You confer happiness to the many fishes, tortoises, crocodiles, geese and birds dwelling in Your Water. and it flows with great force making a loud reverberating sound, splitting asunder mountains of distresses, the distresses which bring our downfall. In the heat of this world, You provide the place of rest and assure great fearlessness; You who gave the place of refuge at Your banks to the son of Rishi Mrikandu (Rishi Markandeya was the son of Rishi Mrikandu). Oh Devi, after I have seen Your Divine Waters, my attachment to the worldly life has indeed vanished. Your waters is revered by the son of Rishi Mrikandu (The son of Rishi Mrikandu was Rishi Markandeya), Rishi Shaunaka, and the enemies of the Asuras (Devas). Your waters are a protective shield against the sorrows of the ocean of worldly existence, caused by repeated births in this ocean of Samsara. You are worshipped by innumerable invisible celestial beings like Kinnaras (Celestial Musicians), Amaras (Devas), and also Asuras and others. Your river-body with auspicious Waters, as well as Your river-banks which are calm and composed, are filled with the sweet sounds of innumerable cooing birds. You confer happiness to great sages like Vashistha, Sista, Pippala, Kardama and others. Your Lotus Feet is held in their heart; and also by sages like Narada and others. You confer Happiness to Ravi (Sun), Indu (Moon), Ranti Deva and Devaraja (Indra) by making their works successful. You cleanse innumerable invisible and visible sins with Your river-body, the banks of which are beautifully decorated with countless Sarasas (cranes or swans). In that Holy Place, You give both Bhukti (worldly prosperity) as well as Mukti (liberation) to all living beings. The presence of Brahma, Vishnu and Shankara in Your Holy Abode provides a protective shield of blessings to the devotees. there, everyone, whether Kirata (Mountain-Tribe), Suta (Charioteer), Vaddava (Brahmin), Pandit (Learned and Wise) or Shattha (Deceitful) gets purified within the dance of Your Waters. By vigorously removing Papa (sins) and Tapa (heat of the miseries of life) of all living beings, You confer that Happiness born of Purification.